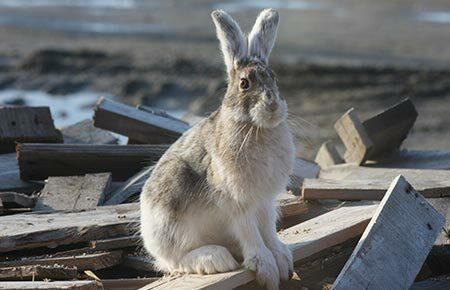 An average of 85% of snowshoe hares won't live past the first year of their lives. Snowshoe hares are somewhat larger than cottontail rabbits. They average around 18 to 20 inches (.5 m) in total length and weigh 3 to 4 pounds (1.4–1.8 kg). In summer the coat is yellowish to grayish brown with white underparts, and the tail is brown on top. This coat is shed and replaced by white pelage in winter, but the hairs are dusky at the base and the underfur is gray. The ears are dark at the tips. The large hind feet are well-furred, adapting these animals for the deep snows of the boreal forests—hence the name "snowshoe." Snowshoe hares breed at about 1 year of age and have two to three litters per year. Breeding begins in mid-May and lasts through August. They exhibit polyandrous breeding habits, where both male and female hares have multiple mates. The gestation period is 36 to 37 days. First litters are born around the middle of May in Interior Alaska and average about four leverets (young hares). The second litter, in years of increasing abundance, often averages six young, and occasionally there is a third litter. Females breed immediately after the birth of a litter. The leverets are born in an unlined depression or “form.” They weigh about 2 ounces (57 g) at birth and can walk by the time their fur is dry. Like all hares, they are born with a full coat of fur and their eyes and ears open. In a day or two they are wandering about the nest, and in less than two weeks will be eating green vegetation. They nurse for about a month before they disburse from the nest. The color pattern of the young snowshoe is similar to the summer pattern of adults. They feed on a wide variety of plant material—grasses, buds, twigs, and leaves in the summer and spruce twigs and needles, bark, and buds of hardwood such as aspen and willow in the winter. The snowshoe, or varying hare (Lepus americanus), is the most common and widespread of the two species of hares in Alaska. It is distributed over the state except for the lower Kuskokwim Delta, the Alaska Peninsula, and the area north of the Brooks Range. It is sparsely distributed along the southeastern mainland except for major river deltas. Snowshoe hares are found in mixed spruce forests, wooded swamps, and brushy areas. They do not dig burrows or build nests but use natural shelters and depressions and rest under branches or bushes. The snowshoe hare travels about on well-established trails or runways which become deeply worn in the snow or forest floor. It is interesting that the winter trails through the deep snow follow the summer pathways. 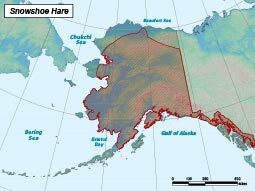 Populations of snowshoe hare are subject to cycles of high abundance and scarcity. The population in an area will build up over a period of years to peak abundance, followed by a sudden decline to a very low level. During periods of peak abundance, there are as many as 600 animals per square mile (230/km²) of range. The exact cause or causes for the decline are unknown. Some possibilities include overbrowsing their food supply, predators, and shock disease due to stress, parasites, or a combination of these. General threats include climate change altering vegetation communities, human development, and mining and fuel exploration and development, by reducing, fragmenting or eliminating habitats. Grasses, buds, twigs, and leaves in the summer and spruce twigs and needles, bark, and buds of hardwood such as aspen and willow in the winter. Avian and mammalian predators, including ground squirrels and red squirrels, gray foxes, red foxes, coyotes, wolves, lynx, bobcats and mink. Breeding begins in mid-May. Females give birth to 2-3 litters averaging 4 young each.